I can’t call myself an SNL buff, and I definitely haven’t seen all the movies crafted by the alumni of the show, but this has got to be near the the top of the list. Here are SNL royalty doing what they do best, singing their hearts out, acting ridiculous for 90 minutes, all in the name of comedy. What’s not to like? Well, assuming you enjoy goofy humor, skit style performances, and an overload of stand-up talent. Oh yeah, and the Three Amigos, perhaps the least likely heroes to ever grace the silver screen. And jokes about Mexicans, those you’ll have to forgive and/or chalk up to satire. But I’m making it sound more complicated than it is; this film is an ultra-silly, incredibly easy, always entertaining mockery of good taste. Enjoy. Lucky Day, Dusty Bottoms, & Ned Nederlander; otherwise known as the Three Amigos! These silent film stars are the belles of Hollywood, playing the brave Latin landowners who always defeat the banditos and save the poor peasant folk. At least on screen. In real life the production company owns their souls and pays them nothing. So these actors & friends, after receiving a letter from Santa Poco, Mexico, leave the studio behind to book a gig themselves. They are off on an adventure, but little do they know that the danger is real. The letter was from an actual town that is terrorized by an actual bandit, El Guapo. The Three Amigos will have to put of the performance of a lifetime if they hope to survive, relying on their fame, skill, and musical expertise to keep them alive. This movie was written by Lorne Michaels, so the SNL vibe is strong. Of course, it also stars three mainstays and co-stars two more; Jon Lovitz & Phil Hartman. And Randy Newman wrote the music for the show, also providing a voice bit in the film. So this is a movie about the cast, a group of talented & hilarious individuals gathering together to make something that’s less about the product and more about the process. 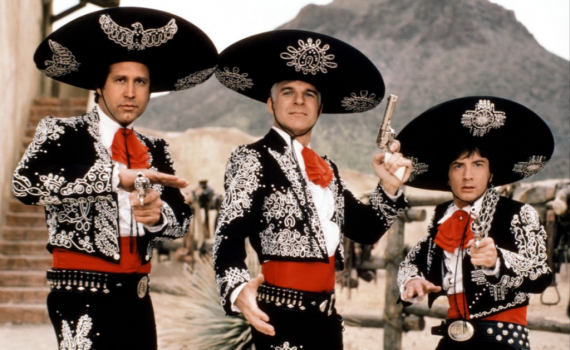 Three Amigos is over-the-top, goofy, childish, but always honestly entertaining, never attempting to be more that a funny skit blown up to Hollywood proportions. Watch for a fun, fast, good time, nothing more, and don’t expect mush else other than some solid laughs and some memorable lines. Let’s ride!